Binge eating is often done secretly and like many other shame-based behaviors, it can wreak havoc on a couple’s relationship. Binge-eating disorder (BED) is often a solo act, so social workers and other clinicians may think of it as a condition or diagnosis that affects only the individual. However, as with addiction diagnoses, BED injures more than the symptom bearer. For a couple, it often has insidious, damaging effects on both partners and the overall relationship. No matter how successful or attractive they are, how normal their weight, or how happy they seem, individuals with BED are walking “shame bombs.” In their own minds, they are not simply overeaters, sweets lovers, noshers, or mindless eaters. They see themselves as being possessed by a demon, grossly defective, and beyond repair, terrified of being out of control around food. Their inability to do something they perceive as so simple and basic as feeding themselves effectively becomes a life sentence of having a dysfunctional relationship with food and their bodies. It is this self-abhorrence that can corrode romantic (and other) relationships. Secret eating involves someone intentionally separating him- or herself from the world. By severing the connection with a loved one, people with BED often disconnect from the best parts of themselves because they feel so ashamed of their binges. People with BED who are secret eaters believe that if their partner discovers them gorging on food, the partner will be just as horrified about the behavior as the binger is—too much of a risk to take with even the most kind, compassionate, and nonjudgmental partner. Compounding the shame and fear of being discovered and consequently rejected and abandoned—which the person with BED sometimes projects—is the guilt and humiliation of keeping this secret from a loved one. As with having an affair, the partner must never find out—or else. Although the BED secret may never be discovered (I had a client who kept her bulimia secret from her partner for nearly 20 years), once it is, there is a breach of trust in the relationship, even if it’s only one sided. Intimacy that manifests when both members of a partnership are candid and honest with each other dissolves when one partner consistently hides something from the other. People with BED often fear that the couple’s social life will be damaged when the partner with BED makes excuses about why the couple doesn’t want to dine out or at other people’s houses. Sometimes the person with BED can share his or her food fears with others, such as potential dining partners, but even if they can, they often don’t. In these instances, the partner without BED has two options, neither of which work well for a relationship over the long haul: stay home or go alone. Even if the partner without BED isn’t a social butterfly, this is the kind of issue that generates power struggles and can become an unresolved conflict that emerges time and again. If the partner without BED chooses to stay home, anger and resentment can curdle positive feelings, compounded by the partner with BED either feeling guilty about ruining a potentially good time or becoming defensive and seeing him- or herself as the victim of a partner who will never understand. Regardless of how frequently they dine out, many couples like entertaining at least once in a while. This may be a problem for the partner with BED, who is more often female and likely to be the family’s chief cook and bottle washer. Bringing challenging foods into the house is a scary proposition for the person with BED: Food may be within easy reach for days before and after the event; she must prepare and cook the food and then serve it; and she often cleans up after the guests have gone home. Many people with BED fear tempting themselves and refuse to have foods that may trigger their desire to binge in the house, sorely limiting entertaining options. Again, this situation can play out in several ways. People with BED may make excuses about why they do not want to entertain, such as being dissatisfied with how the house looks, time constraints that would make entertaining difficult, or even feigning disinterest in socializing. Partners without BED may be disappointed, feel resentful, and give up trying to plan events or they may override a partner and invite people over anyway. Whatever their response, bad feelings generally linger with both partners, and the issue resurfaces repeatedly, with partners with BED feeling guilty and at fault and their partners feeling marginalized and resentful. Too often people with BED send out the message to their partner, “Honey, please save me from myself.” Many people with BED cling to a rescue fantasy with a partner who is all too willing to hide the chocolate, guard the leftovers, or refrain from buying “temptations.” It’s one thing to occasionally ask a partner to “Please, get those candies away from me,” and another to expect someone else to be in charge of doling out a partner’s food or protecting the partner from it on a regular basis. Many partners feel powerless to aid people with BED in eating less and view controlling food intake as exhibiting caring. Unfortunately, this enabling dynamic prevents the individuals with BED from learning to manage food on their own. Codependence puts binge-eating struggles at the center of a relationship. Whether food shopping or eating out, what can and cannot be eaten is a major focus for both partners. The partner with BED can become the other partner’s pet project and may value the help received yet also resent it. The partner without BED may dislike the role of enabler but may believe that opting out will trigger the other partner’s downfall. Daily decisions about when and what to eat are often difficult enough for a couple (or family) to make without throwing BED into the mix. People with BED may try hard to eat healthfully. Sauces, fried dishes, and any foods high in fat or sugar—even pasta, potatoes, or breads—may be eschewed, while the partner without BED may find the healthful fare too limiting or unappetizing. Sometimes couples end up eating different foods at the same time, and that can be a realistic solution. But it’s equally possible that people with BED will feel (consciously or unconsciously) envious of and angry about the goodies a partner is eating, which may trigger a binge later on. In this situation, the partner without BED also might feel guilty about eating a calorie-laden dish while the partner with BED is munching on sprouts and cottage cheese. Dynamics really go awry when a partner intentionally or inadvertently sabotages a person with BED’s best intentions. A partner without BED may keep offering “off-limit” foods to the person with BED, feeling guilty that a plate of steamed vegetables seems so insufficient for a meal. However, the partner with BED may be eating those vegetables because he or she won’t binge on them and will feel in control of what is being eaten. Sabotage also occurs when overt or covert power struggles are at play, such as when the partner without BED becomes a food pusher to retaliate, upset, or derail the successes or progress of the partner with BED. Another type of sabotage occurs when the partner with BED starts to eat more normally and lose weight. If the partner without BED is threatened by this weight loss, he or she may start offering food temptations until the partner with BED finally breaks down and abuses food. This kind of dynamic can also occur intermittently with enabling; that is, sometimes the partner without BED works hard at getting the partner with BED to eat healthfully and then becomes tired of or angry at this role so that he or she ends up consciously or unconsciously triggering the partner’s binge. Dynamics are different when both partners have BED. It may be difficult for normal-eating clinicians to understand, but people with BED often find great intimacy in abusing food together. Maybe it’s one of many lifestyle choices they share or, more likely, it’s one of the few that promotes a sense of closeness. They may bond over rebelling and doing something that others see as wrong or they may have come from families where food and eating together was an expression of closeness. Food shopping, cooking, and cleaning up together may be a way to share time and loving feelings. Food abuse may be ego-syntonic when it’s a family affair, but what happens when one partner wants out, perhaps to eat more healthfully under doctor’s orders or because of a serious health condition or simply to junk the junk food and lose weight? If both partners are on board for this kind of change, they can offer mutual support; but if only one wants to change, the couple may be headed down a rocky road. 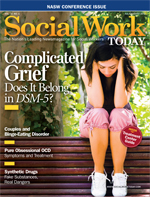 Social workers and other clinicians don’t need to provide couples therapy to resolve joint issues generated by BED, but it greatly helps if both partners are open to exploring solutions together in and out of treatment. Treating a couple when one partner has BED is no different than treating other couple’s issues, with one caveat: The therapist must fully understand that BED is a bona fide disorder, and the partner with BED cannot be told just to say no to food or go on a diet. The disorder itself needs specialized treatment just as a professional would give to other substance abusers. However, even without providing targeted BED therapy, there is a great deal that can be done to help a couple in which one partner has BED and the other doesn’t. The clinician’s first job is to help clients with BED and their partners fully understand the condition, including describing the diagnosis to the couple and asking them to read up on the subject. The next step is to either explain the condition to the partner or, better yet, support clients with BED in telling their partners how they feel around food. This may involve going into family or trauma history because it is necessary for addressing dysfunctional couples’ dynamics that both partners be on the same page. If partners aren’t accustomed to talking about personal or vulnerable issues, work first must be done to foster open communication. If clients with BED are also secret eaters, this disclosure must be made. People with BED will be frightened about sharing their shame but, more often than not, partners are understanding or do not condemn as feared. When empathy from the partner without BED is received and the secret is out in the open, shame is reduced. Helping clients with BED and/or partners assess how eating is currently handled within the relationship reduces shame in the symptom bearer, teaches partners how each may be contributing to the problem, and gives them the clear message that their current actions may be hurting them. Shifting the problem from the partner with BED to the couple gives them both the mandate and the power to change. Toward this end, I ask each partner to make a two-part list—”ways I contribute to the problem” and “ways my partner contributes to the problem”—which is then shared and discussed. The next step involves the therapist noting dysfunctional dynamics in the couple regarding intimacy and power. For example, the wife likes to care for her husband by feeding him, and he rebels by binge eating because she reminds him of his domineering mother. Or he enjoys the power of protecting her from abusing food because it makes him feel needed, which she both values and resents because she knows she needs to learn to manage food herself. Strategies must encompass changes in each individual and within the relationship. As therapists, we know that, in general, each partner contributes to problems, and each must keep their part of the bargain to achieve a new, more healthful status quo. I ask partners to add to their two-part list two more categories: “ways I want to change” and “ways I would like my partner to change.” This list is then shared and discussed, modified if necessary, and agreed on as a plan of action. Additionally, it is often necessary for the couple to set aside time each week to discuss how they’re doing on this issue. Partners with BED get to talk about progress (or lack thereof) made in ending binge eating and changing unhealthy couple dynamics, while partners without BED share perceptions and progress (or lack thereof) in engaging in behaviors to truly help the partner with BED. The above is a basic outline of how treatment of BED within a couple can be approached. Of course, along the way, other problems must be addressed that impede progress, such as mental health issues, addictions, abuse, stress, and poor communication. Whether doing couples or individual work with people with BED, it is vital that the therapist emphasize that change takes time, that there will be periods of standstill and regression, but that both the individual problem of BED and the couple’s problems regarding it can be overcome with caring, practice, and patience. The good news for the partners is that their hard work pays off doubly: by helping heal the partner with BED’s food problems and improving the couple’s relationship. — Karen R. Koenig, LCSW, MEd, is an international author and national expert on the psychology of eating. Her books include The Rules of ‘Normal’ Eating and What Every Therapist Needs to Know About Treating Eating and Weight Issues.